Medeci Two Handled Cup - Blue. The blue version of the Medeci Two Handled Cup has a unique handle design which allows the user to position the handles where they require allowing the user to grip the cup securely with ease whilst remaining in full control. Manufactured from ABS plastic to ensure that the Medeci Two Handled Cup is durable, which makes it more versatile incase of dropping, and is also suitable for use in the dishwasher. 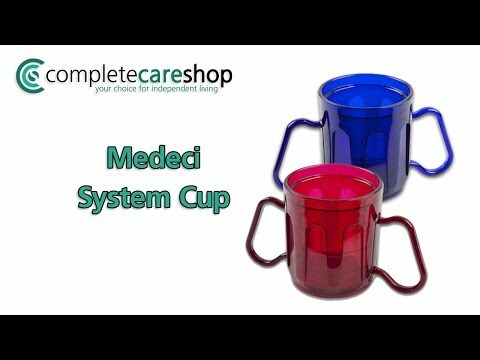 The large, adjustable handles make the Medeci Two Handled Cup ideal for those users who suffer from tremors, shakes, visual impairments and dementia, as they can be easily positioned to the users needs.